LowBlueLights.com was set up by Photonic Developments LLC, and its parent, the Lighting Innovations Institute of John Carroll University. The trio of highly decorated scientists who first established the corporation at the beginning of 2005 and the website several months later, together enjoy more than a century of experience in high-level physics, and have won more than 100 U.S. patents. 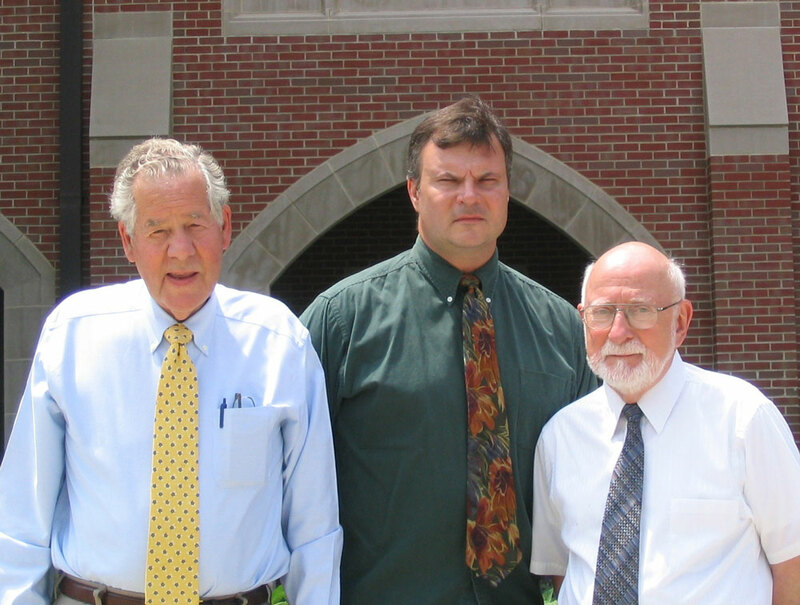 Below is a photograph taken of the three soon after they established the website. It is followed by brief descriptions of their backgrounds, together with that of the fourth partner of the corporation who joined them in 2007. Dr. Hansler spent 42 years as a senior scientist at the world-renowned GE Nela Park lighting laboratory, where he was instrumental in the development of several lighting techniques and applications. Shortly after retiring in 1996, he formed the Lighting Innovations Corporation, where he has drawn on his vast technical knowledge and wide industry contacts to continue to push the boundaries of lighting technology. Since its inception, the corporation has received over $1 million in funding from such federal agencies as the Federal Aviation Administration and NASA, and additional support from private industry. Dr. Hansler holds a doctorate in physics from Ohio State University, and served as an adjunct physics professor at John Carroll University. His work has won 86 U.S. patents, with more currently pending approval. He occasionally serves as an expert witness in legal cases that center on his technical specialty. Dr. Carome is a retired professor of physics at John Carroll University. During his long and distinguished career, he has consulted widely with industry and governmental agencies, and has published widely in technical journals. He has been awarded 21 U.S.patents. For more than two decades, he conducted leading-edge research on fiber optics. His research has attracted more than $2 million in federal funding from such agencies as NASA, the FBI, the National Institutes of Health, the Office of Naval Research and the Army Office of Research, among others. The State of Ohio and such leading corporations as British Petroleum, Goodyear Aerospace and Litton Industries have added an additional $1 million or more in support for his research. Dr. Carome holds a doctorate in physics from Case Institute of Technology. Mr. Kubulins has a masters degree in physics from John Carroll University. Since completing his degree some years ago, he has worked closely with Dr. Carome on the development of fiber optic instrumentation. His work has embraced fiber sensors of several types and fiber optics for illumination. In addition to his work at the university, he has participated in many projects for such leading organizations as GE Lighting, Fiberstars, Gelcore and Optical Research Associates. He holds a number of U.S. patents, one based on his work on a hemispherical optical sensors and several on his work on airport lighting systems. Dr. Martin Alpert is a retired physician and engineer. After completing his M.D. and M.S. at Case Western Reserve University, he has spent nearly 30 years as an entrepreneur, identifying previously unknown markets and building first-to-market companies. These companies capitalize on ensuing rapid industry growth using innovative business models that enable them to launch with minimal funding through organic growth. One of his first companies produced the first peripherals for personal computers and, on a $5,000 investment, grew to over $30 million without outside financing. He later started another company that became the fastest growing US high-tech company of the year according to BusinessWeek. He has been involved with eliminating extreme poverty and hunger in the world and addressing trans- and supra-national issues. He holds multiple patents in diverse fields including appliances, sports, automotive and computers/communications and is an IFR multi-engine pilot.